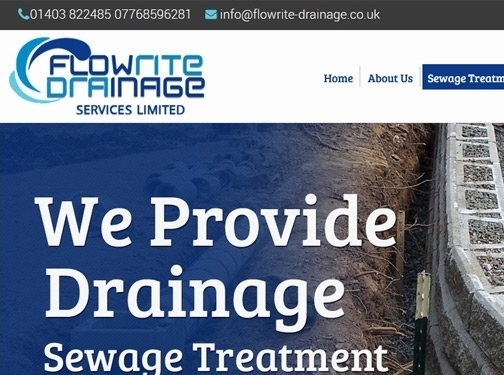 Drainage and Guttering - Flowrite Drainage Ltd.
Flowrite Drainage offers a variety of drainage and sewer treatments across West Sussex including 24/7 drainage emergency services and CCTV inspections. We are a leading consultant and have extensive knowledge of drainage and sewer systems and so will be able to help with any issues or questions about drainage. UK (Horsham) based business - with over 30 years' experience - providing drainage and sewer treatment services. Website includes details of services provided, work examples, accreditations gained, associations, geographical areas covered, full contact details. Company website has been online since 2012 according to web.archive.org.